(born in 1963) – professor of literature studies, literary critic, writer, in 1999-2012 she worked as the editor-in-chief of the Pogranicza bi-monthly magazine about Szczecin culture. 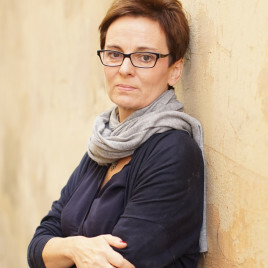 She has published novels, including: Bambino (2008), Ku słońcu (2010) and Na krótko (2012), W powietrzu (2014), Pięćdziesiątka (2015), an autobiographical essay entitled Umarł mi (2013) and a collection of articles titled Blogotony (2013). Former member of the jury of the Nike Literary Award, one of the originators of the Gryfia Literary Award for a Female Author, President of the Polish Autobiographical Society. She works at the University of Szczecin. She was also awarded the title of the Szczecin Ambassador.